If you play flute, then you either already love J.S. Bach, or you're about to (hopefully, and very likely) discover that you love Bach. His music is enriching for slow warmups, fun and thrilling for fast and light finger technique, great for playing along with the tuning drone while improvising over a Bach riff, or for re-arranging at will, creating your own fantasies and variations. As they say in the BBC film below, this is the music that inspired Beethoven, Chopin, Tchaikovsky! And you too! I know that what summer flute students want is to catch that J.S. inspiration and soar with it! Well, here it is; an eight part documentary from the BBC on what makes Bach great and links to go play the sheetmusic you hear! Catch the enthusiasm, then look up the pieces with the links provided, as almost all are free sheetmusic in public domain and available as pdf sheetmusic, and so it's easy to play along with the computer speakers blasting out the best Bach you could hear! What a fun way to hog the living room or practice space! Hours of inspiration and fun! It's the most fun thing to do when practicing this summer besides playing duets by recording one of the parts. Go try it! Great for the mind and soul! The wonderful BBC Bach documentary is embedded here (so captivating! who knew Bach was such a rebel at 19?) and links to free J.S. Bach flute music below, as well as best recommended Bach flute works for free or worth buying. For flutists who are intermediates, "outlining" (playing only one longtone per bar, or two, or three to outline the fundamental melodic line) works amazingly with Bach! You'll see for yourself. Or search my blog for more "outlining" information on this blog or from my fluteloops radio show no. 10-11. First, a quick, captivating film: I was glued to this passionate portrayal by the BBC and the musicians who took part. The Bach Handbook by Robert Stallman: suits novice, intermediate and advanced students with short transcriptions of Preludes, Allemandes, Bourees, Gigues, Minuets, all transposed to suit the modern flute, and beautifully edited. This is the best single buy for $10 that any flutist can make. Super fun as warmups, and a great gig book for solo flute. Bach Sonata books by Paul Edmund Davies: These are the six flute sonatas with piano parts, flute book, and two CDs; one with the flutist performing, and one without. Beautifully edited, good quality printing, great tempi and interpretations. Very enjoyable to use at home to perform with the backing tracks of cellist and harpsichordist. See and hear samples of Davies Bach books: Volume 1 here. All Three volumes at Davies website under Bach tab. Some useful free sheetmusic for flutists! 24 Concert Etudes transcribed from Bach: click on Bach when you arrive. And click below on the blog COMMENT button below to see a list of these 24 etudes and which J.S. Bach pieces from which they originally derive. J.S. 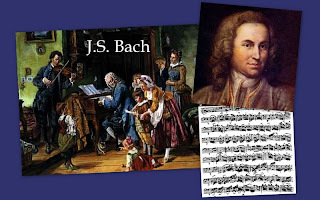 Bach Orchestral flute parts: you can play along with online recordings or youtube videos. Oboe parts, voice parts, or string parts also interesting to play. Check out all the Brandenburg Concertos that have flute parts. Or play oboe parts! All are beautiful and interesting to learn. Flute 1 part free pdf. Or go to the link below for Brandenburg or other works. And finally; here's what Bach can do with one single melody, and what a great flutist can do with that Chaconne BWV 1004. Bouriakov plays part 1 on youtube. Part 2 of Denis Bouriakov playing the Bach Chaconne is here. And here's one of the several transcriptions in pdf of theChaconne for flute BWV 1004. From where do they derive? This complete listing comes from the NFA Newsletter, Vol. IX, No. Fritz Schindler, of Switzerland, B.1871. I'd like to point out that the violin transcription - allthough beautifully made by Werner Icking - does not favour the flute. In my opinion, the original version/keys suits the flute so very well, there is no need to transpose anything! People can take the Werner Icking edition of the original text for cello, or the transcription for viola - wich is the same text. When playing the cello version on the flute, you it sounds 2 octaves above, or just 1 octave if you take the viola version. I know - people have a hard time trying to read music written in anything but the G-clef. Here I must say, if you really want to learn something from Bach - the greatest music teacher of all times - you've got to learn AT LEAST one more (the F-clef of course). There is NO excuse for refuing to acquire such a basic (and easy) skill. Some of the solo violin pieces, on the other hand, work very well for the flute - if you take the viola (or even the cello) transcription! No need for changes in melody direction; everything but the chords sound just as they should. A number of other problems arise when you try to play from the original text. Chords, phrasing, breathing, and such. All that stuff challenges one self in a highly constructive way. There is SO MUCH you can learn going through that process. All that is taken from you when you just pick a flute transcription, no matter who made it. I hope I could motivate a couple more people to try and learn music from Bach himself. I've been doing that for more years than I can remember, and cannot get tired of it! Thank you for posting this documentary, it is wonderful! Where do you find these things? :) From a church music prospective, Bach was most definitely born to be Catholic church composer, his skills, his rich harmonies and level of technical difficulty is not compatible with congregational participation that Reformation viewed as a key component of church service. No wonder Lutheran pastors had difficulty working with him. I really liked that part in the documentary where one of the musicians pointed out that Bach was able to take secular music and put it to use to the glory of God. In fact, the only time I have ever heard church mentioned growing up in a strict Soviet Union environment was in music history class. Bach through his music was able to bring the light of God's presence to the most hostile of places centuries after his own death. Pretty cool!